Why See Los Angeles Philharmonic - Dudamel and Yuja Wang? World renowned piano virtuoso Yuja Wang joins forces with Gustavo Dudamel and the LA Philharmonic to bring celebrated American composer John Adams' brand new, world premiere work 'Must The Devil Have All The Good Tunes?' to the stage for four special performances only this winter. The third of Adams' piano concertos, the piece's title was inspired by an article about Dorothy Day Adams spotted in an old New Yorker magazine. Beginning with a gospel-like riff played bass register, the concerto wildly builds into zigzagging chromatic lines that emphasise a dance-like dialogue between the piano and the orchestra. The second section begins serenely with a delicate piano solo before bursting into a restless melody Adams says was directly inspired by Wang's passionate performance style. Its rousing finale section is filled with a virtuosity and playfulness further suited to Wang. Adams - Must The Devil Have All The Good Tunes? 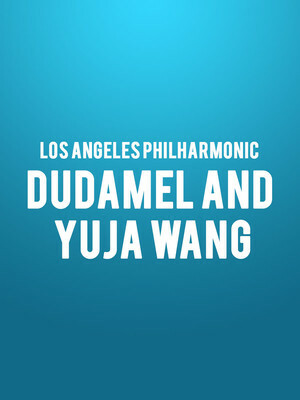 Seen Los Angeles Philharmonic - Dudamel and Yuja Wang? Loved it? Hated it? Sound good to you? Share this page on social media and let your friends know about Los Angeles Philharmonic - Dudamel and Yuja Wang at Walt Disney Concert Hall. Please note: The term Walt Disney Concert Hall and/or Los Angeles Philharmonic - Dudamel and Yuja Wang as well as all associated graphics, logos, and/or other trademarks, tradenames or copyrights are the property of the Walt Disney Concert Hall and/or Los Angeles Philharmonic - Dudamel and Yuja Wang and are used herein for factual descriptive purposes only. We are in no way associated with or authorized by the Walt Disney Concert Hall and/or Los Angeles Philharmonic - Dudamel and Yuja Wang and neither that entity nor any of its affiliates have licensed or endorsed us to sell tickets, goods and or services in conjunction with their events.